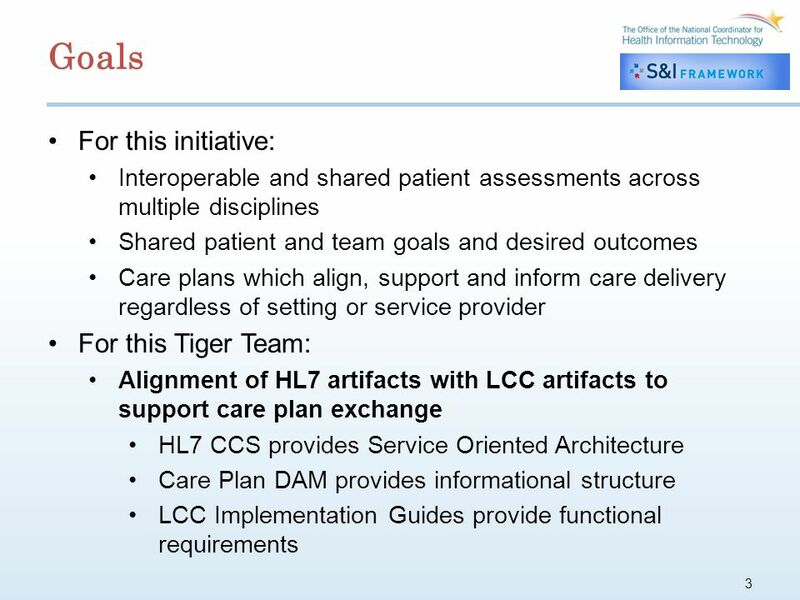 Longitudinal Coordination of Care (LCC) Workgroup (WG) HL7 Tiger Team Service Oriented Architecture (SOA) Care Coordination Services (CCS) June 26, 2013. 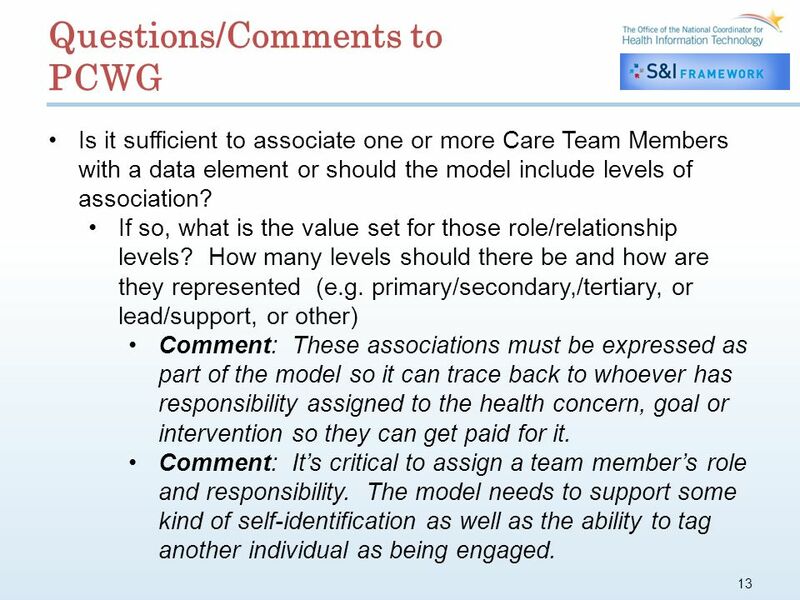 13 13 Questions/Comments to PCWG Is it sufficient to associate one or more Care Team Members with a data element or should the model include levels of association? If so, what is the value set for those role/relationship levels? How many levels should there be and how are they represented (e.g. 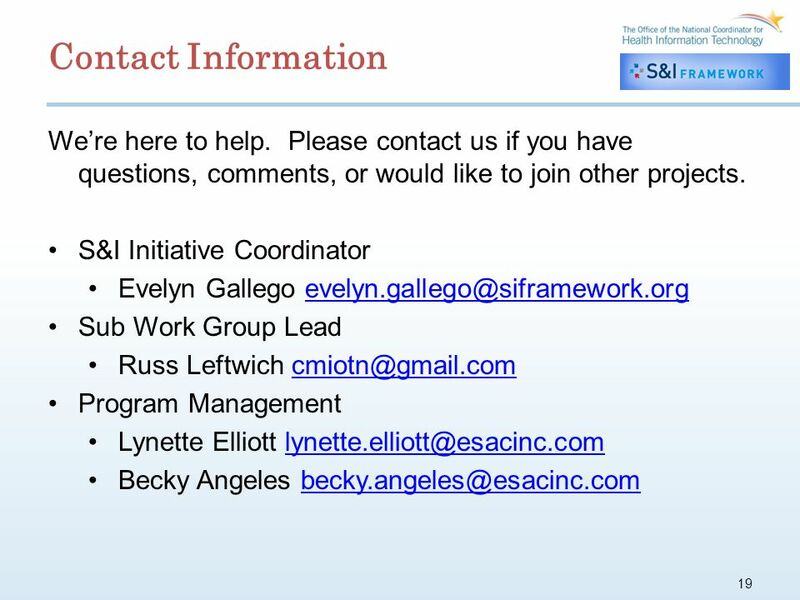 primary/secondary,/tertiary, or lead/support, or other) Comment: These associations must be expressed as part of the model so it can trace back to whoever has responsibility assigned to the health concern, goal or intervention so they can get paid for it. Comment: Its critical to assign a team members role and responsibility. The model needs to support some kind of self-identification as well as the ability to tag another individual as being engaged. 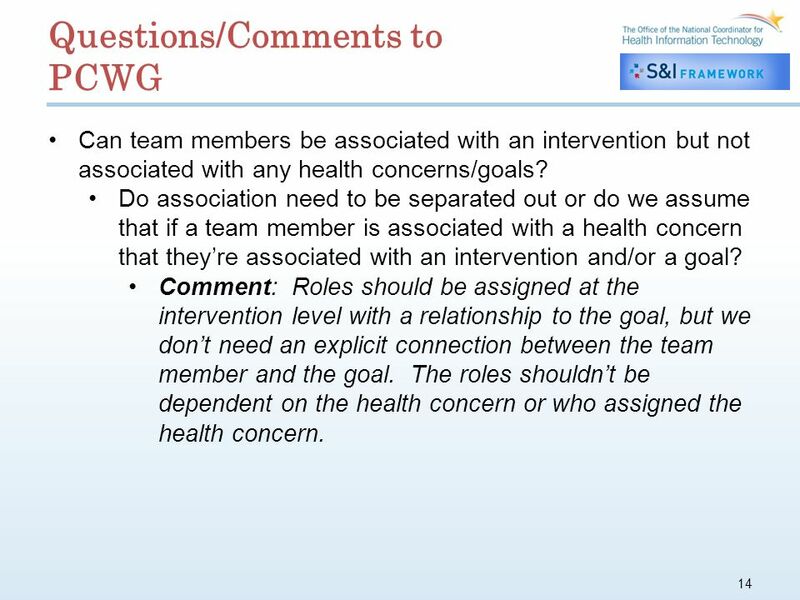 14 14 Questions/Comments to PCWG Can team members be associated with an intervention but not associated with any health concerns/goals? 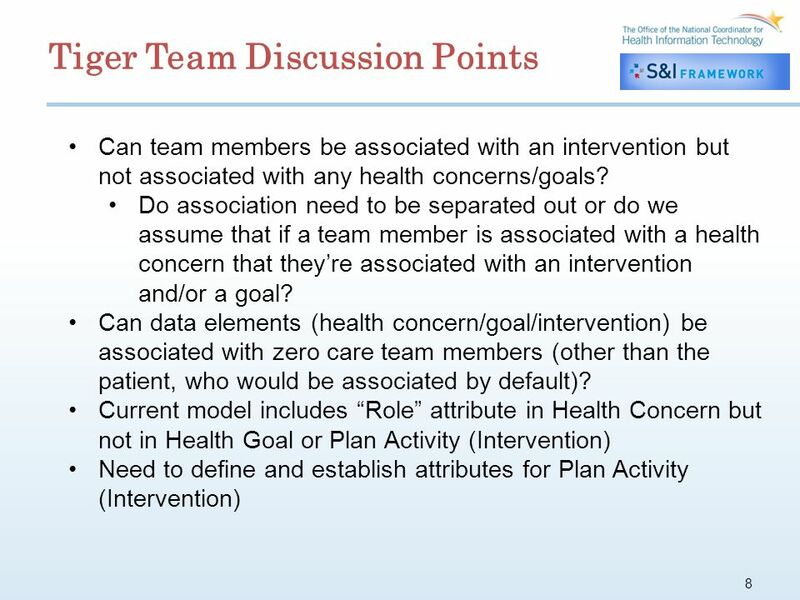 Do association need to be separated out or do we assume that if a team member is associated with a health concern that theyre associated with an intervention and/or a goal? 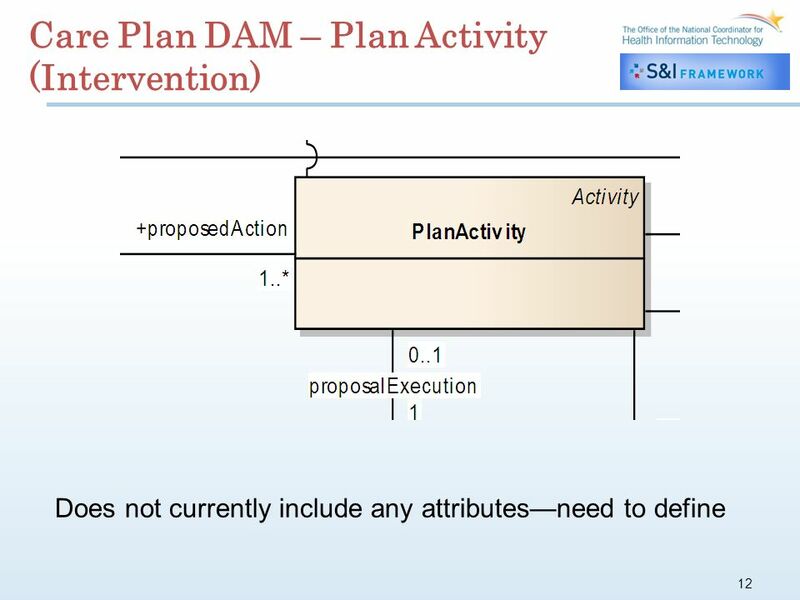 Comment: Roles should be assigned at the intervention level with a relationship to the goal, but we dont need an explicit connection between the team member and the goal. The roles shouldnt be dependent on the health concern or who assigned the health concern. 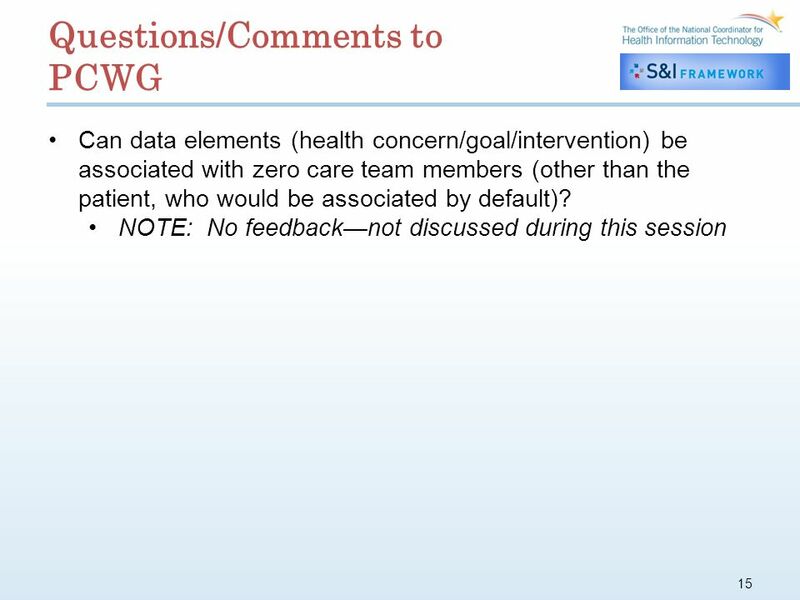 16 16 Questions/Comments to PCWG Current model includes Role attribute in Health Concern but not in Health Goal or Plan Activity. Comment: It would be helpful to establish a taxonomy to support how the association/relationship will be used (e.g., as a messaging filter to only send information to certain entities and/or showing who is involved and their sub-roles and/or other). 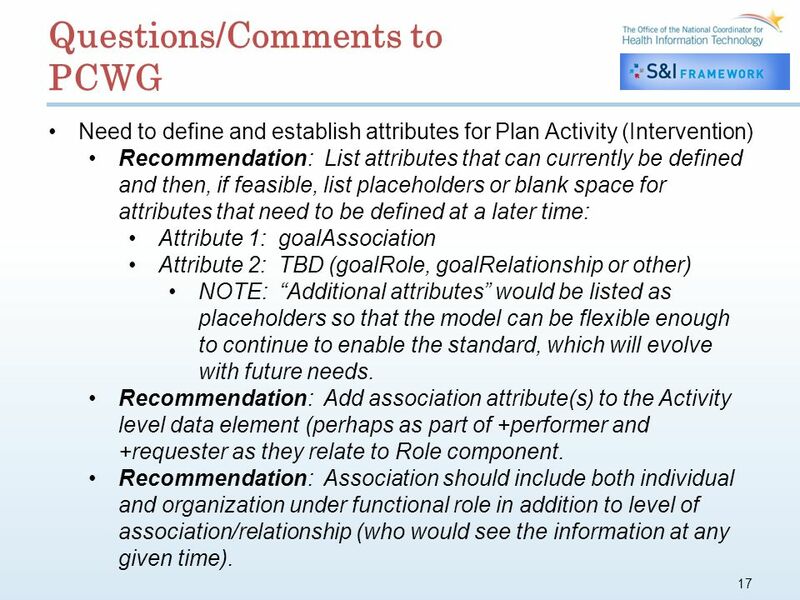 17 17 Questions/Comments to PCWG Need to define and establish attributes for Plan Activity (Intervention) Recommendation: List attributes that can currently be defined and then, if feasible, list placeholders or blank space for attributes that need to be defined at a later time: Attribute 1: goalAssociation Attribute 2: TBD (goalRole, goalRelationship or other) NOTE: Additional attributes would be listed as placeholders so that the model can be flexible enough to continue to enable the standard, which will evolve with future needs. 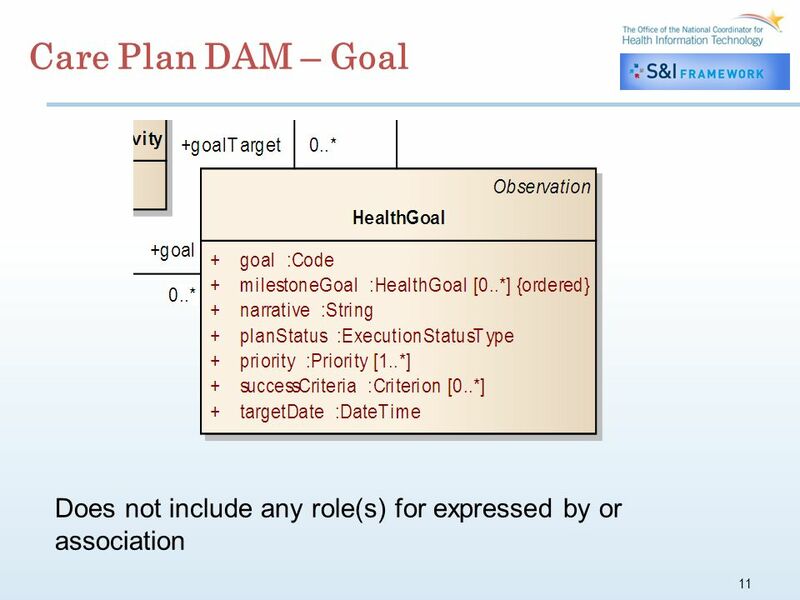 Recommendation: Add association attribute(s) to the Activity level data element (perhaps as part of +performer and +requester as they relate to Role component. 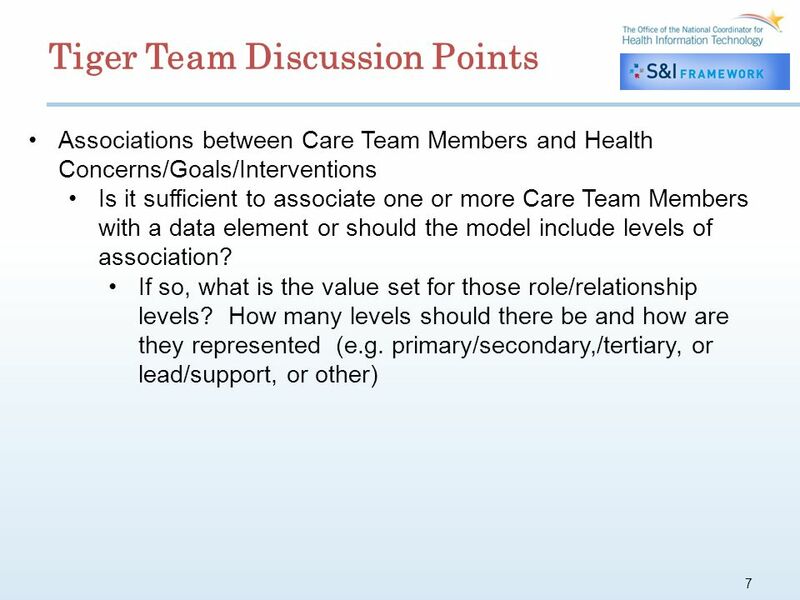 Recommendation: Association should include both individual and organization under functional role in addition to level of association/relationship (who would see the information at any given time). 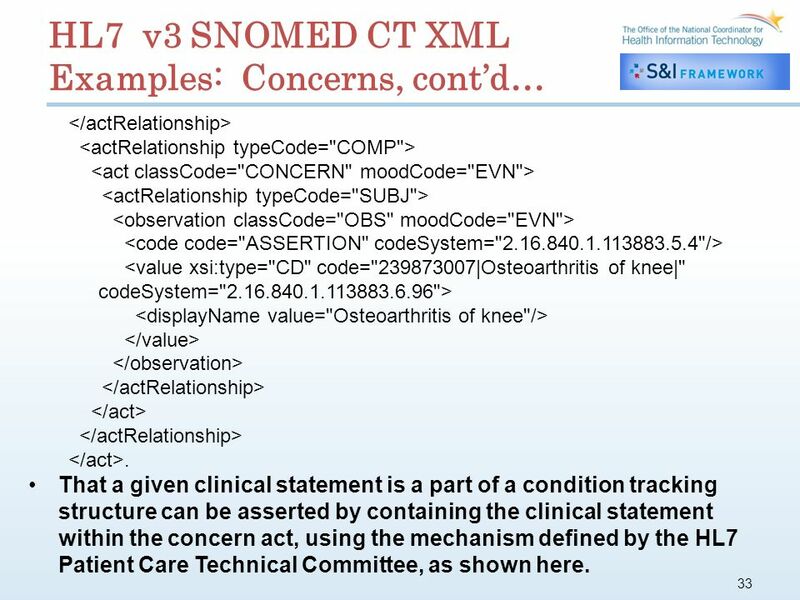 26 26 HL7 v3 SNOMED CT Definitions, contd… "Diagnosis": The term "diagnosis" has many clinical and administrative meanings in healthcare A diagnosis is the result of a cognitive process whereby signs, symptoms, test results, and other relevant data are evaluated to determine the condition afflicting a patient. A diagnosis often directs administrative and clinical workflow, where for instance the assertion of an admission diagnosis establishes care paths, order sets, etc. A diagnosis is often something that is billed for in a clinical encounter. In such a scenario, an application typically has a defined context where the billable object gets entered. "Concern": A concern is something that a clinician is particularly interested in and wants to track. 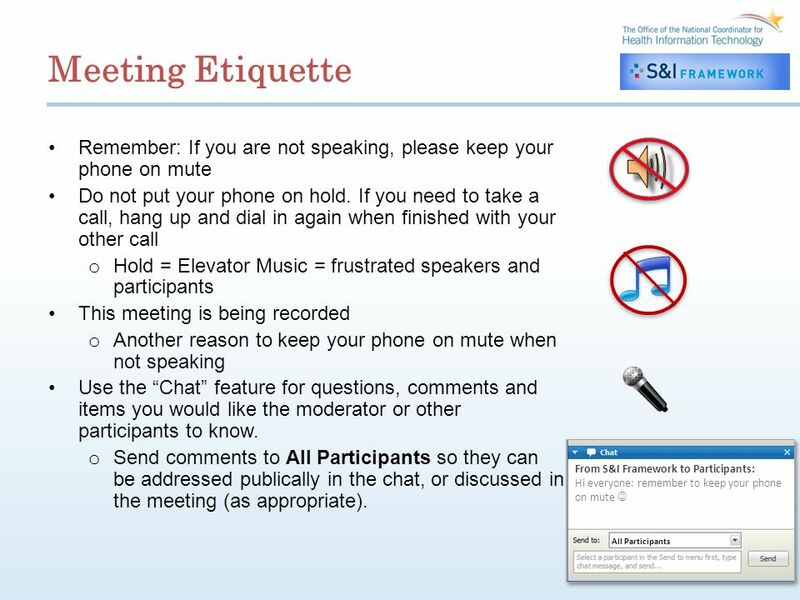 It has important patient management use cases (e.g. 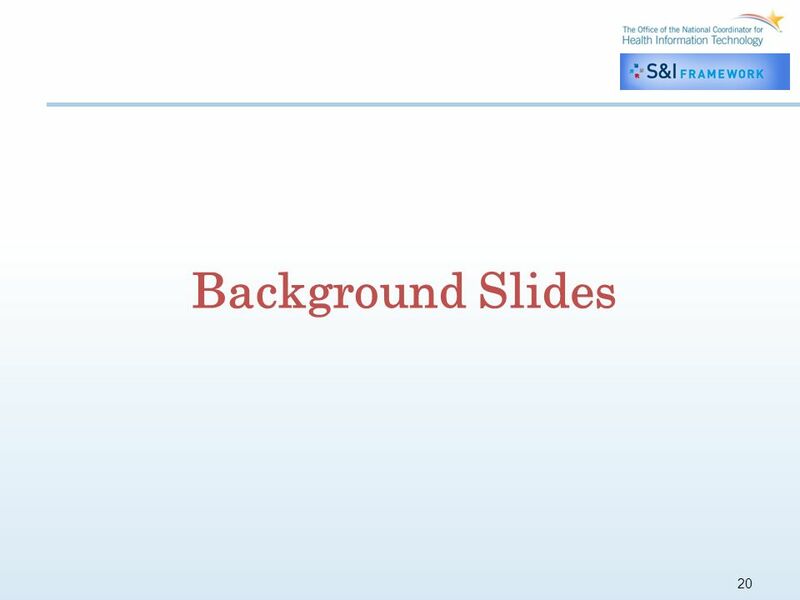 health records often present the problem list or list of concerns as a way of summarizing a patient's medical history). 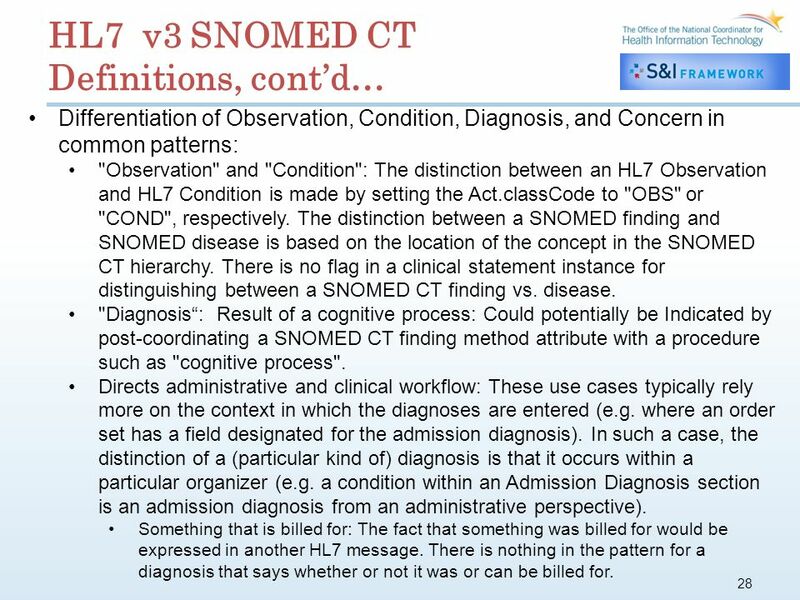 27 27 HL7 v3 SNOMED CT Definitions, contd… Differentiation of Observation, Condition, Diagnosis, and Concern in common patterns: "Observation" and "Condition": The distinction between an HL7 Observation and HL7 Condition is made by setting the Act.classCode to "OBS" or "COND", respectively. 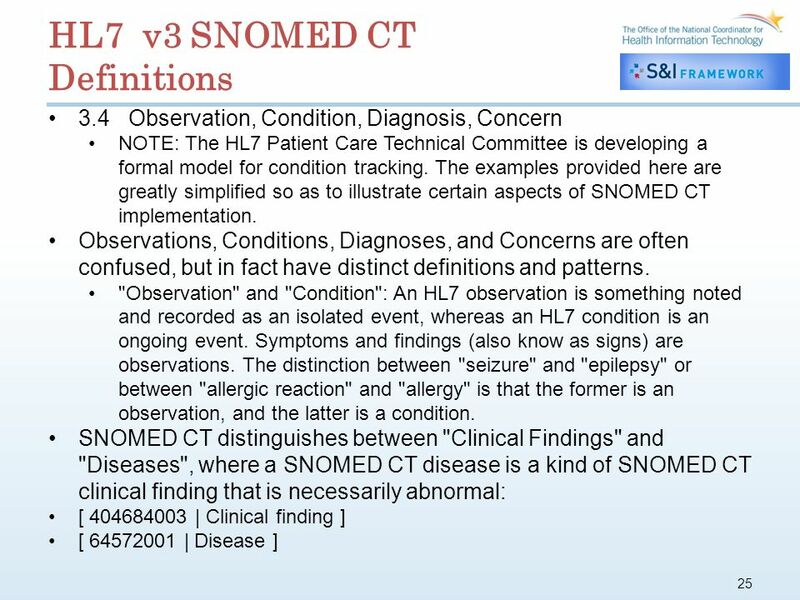 The distinction between a SNOMED finding and SNOMED disease is based on the location of the concept in the SNOMED CT hierarchy. 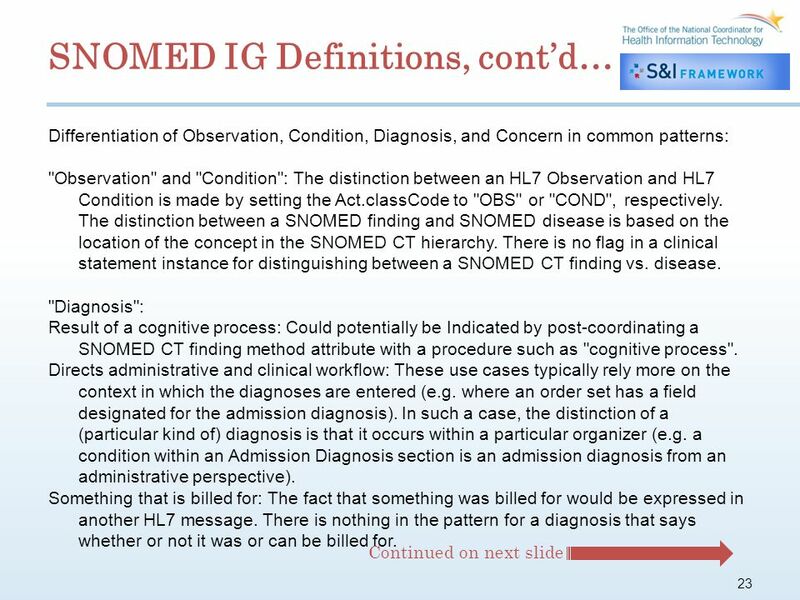 There is no flag in a clinical statement instance for distinguishing between a SNOMED CT finding vs. disease. 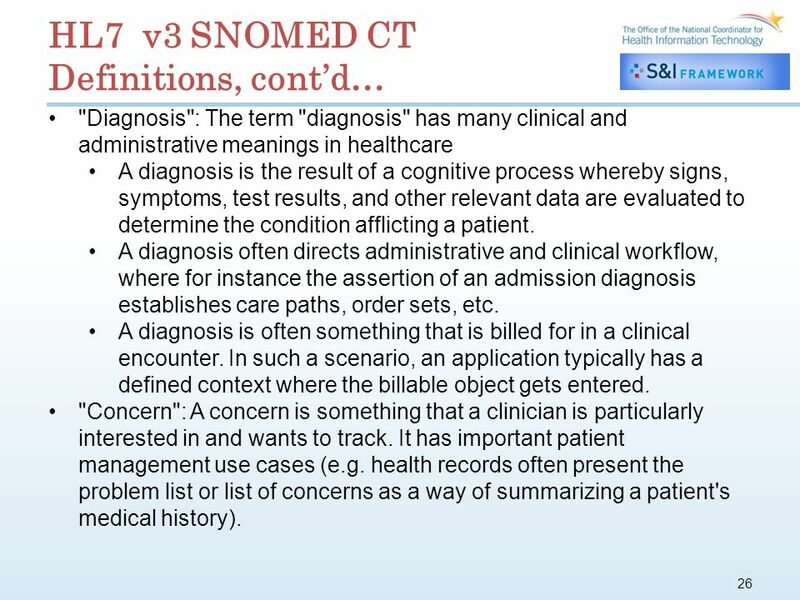 "Diagnosis": Result of a cognitive process: Could potentially be Indicated by post- coordinating a SNOMED CT finding method attribute with a procedure such as "cognitive process". Directs administrative and clinical workflow: These use cases typically rely more on the context in which the diagnoses are entered (e.g. where an order set has a field designated for the admission diagnosis). In such a case, the distinction of a (particular kind of) diagnosis is that it occurs within a particular organizer (e.g. 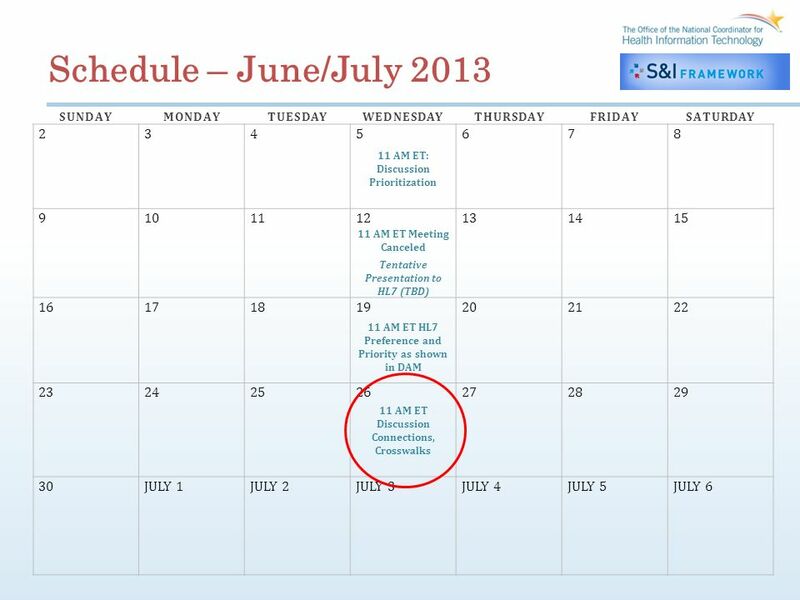 a condition within an Admission Diagnosis section is an admission diagnosis from an administrative perspective). 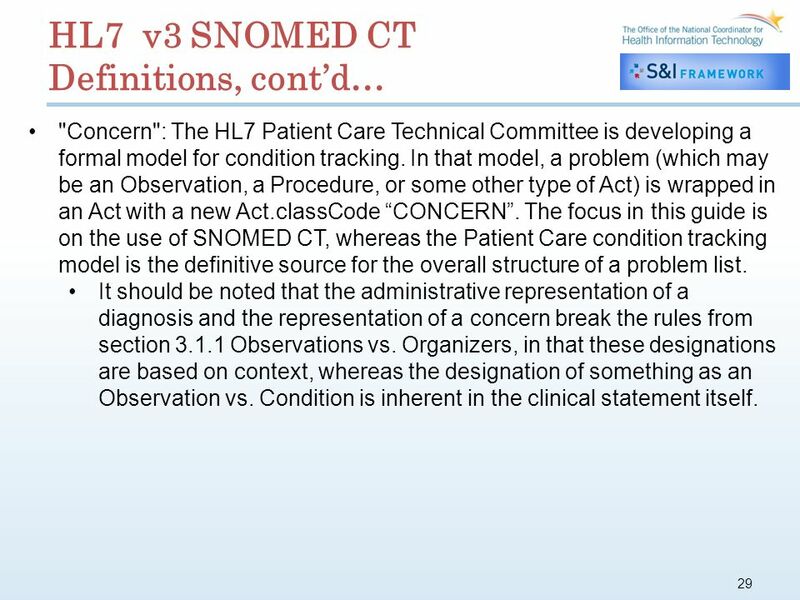 28 28 HL7 v3 SNOMED CT Definitions, contd… Differentiation of Observation, Condition, Diagnosis, and Concern in common patterns: "Observation" and "Condition": The distinction between an HL7 Observation and HL7 Condition is made by setting the Act.classCode to "OBS" or "COND", respectively. 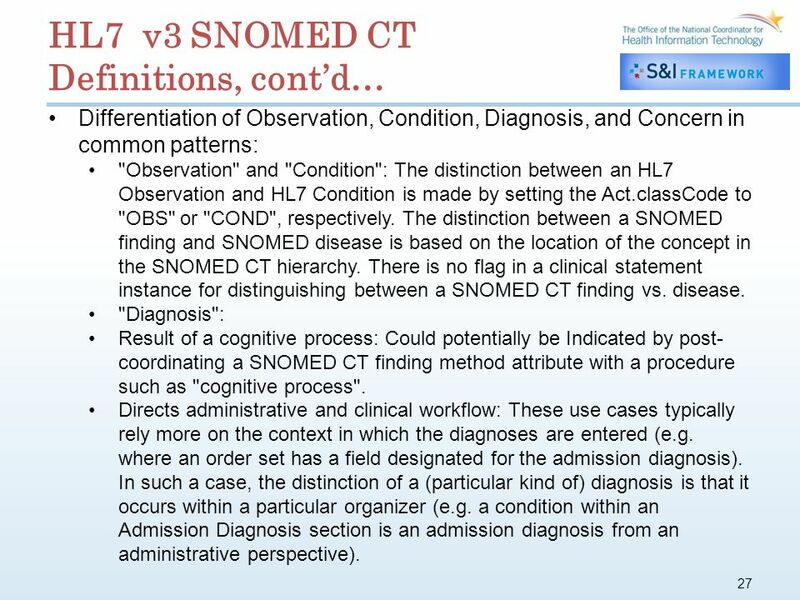 The distinction between a SNOMED finding and SNOMED disease is based on the location of the concept in the SNOMED CT hierarchy. 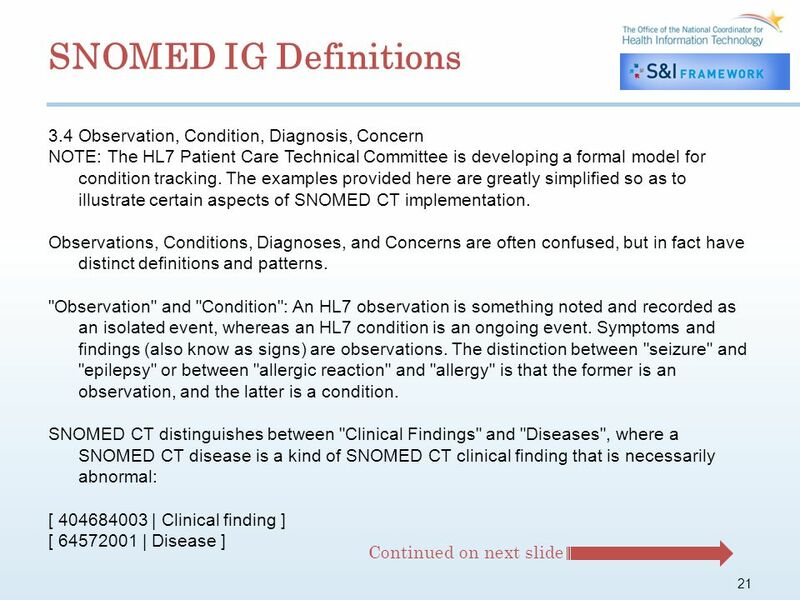 There is no flag in a clinical statement instance for distinguishing between a SNOMED CT finding vs. disease. 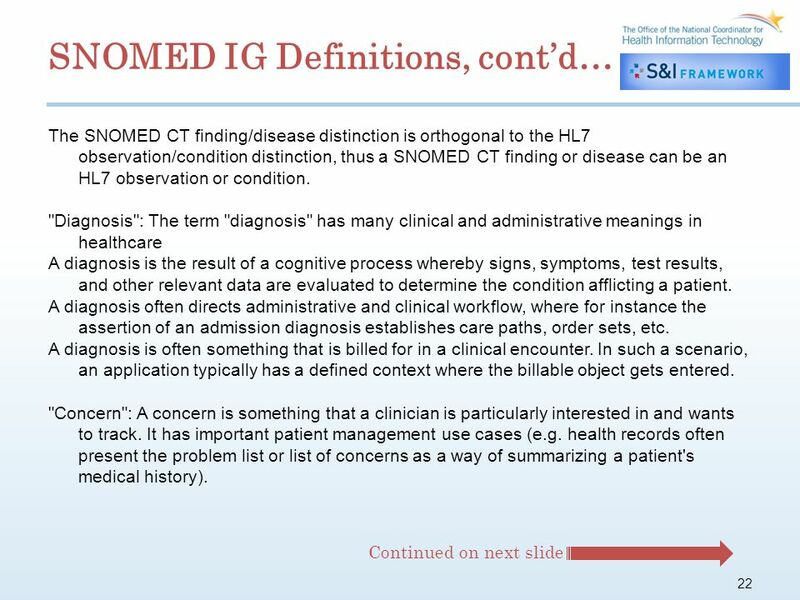 "Diagnosis: Result of a cognitive process: Could potentially be Indicated by post-coordinating a SNOMED CT finding method attribute with a procedure such as "cognitive process". Directs administrative and clinical workflow: These use cases typically rely more on the context in which the diagnoses are entered (e.g. where an order set has a field designated for the admission diagnosis). In such a case, the distinction of a (particular kind of) diagnosis is that it occurs within a particular organizer (e.g. a condition within an Admission Diagnosis section is an admission diagnosis from an administrative perspective). 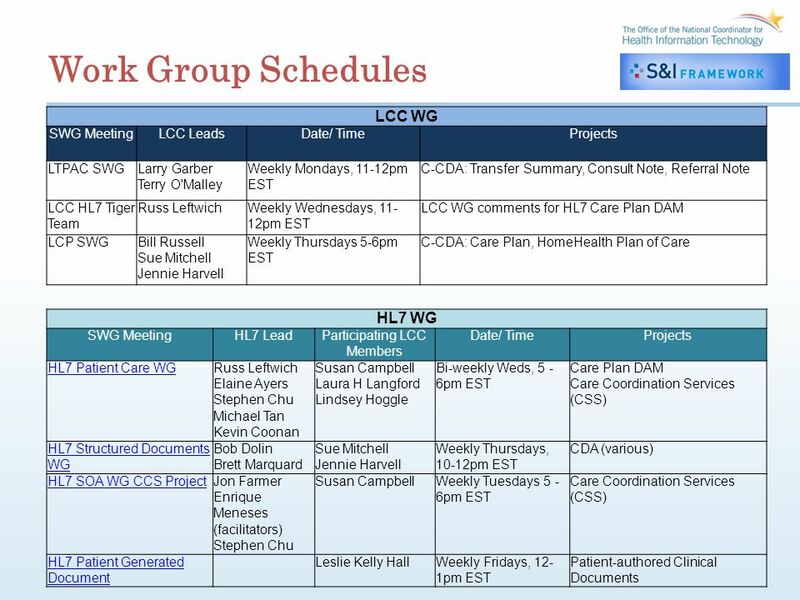 Something that is billed for: The fact that something was billed for would be expressed in another HL7 message. There is nothing in the pattern for a diagnosis that says whether or not it was or can be billed for. 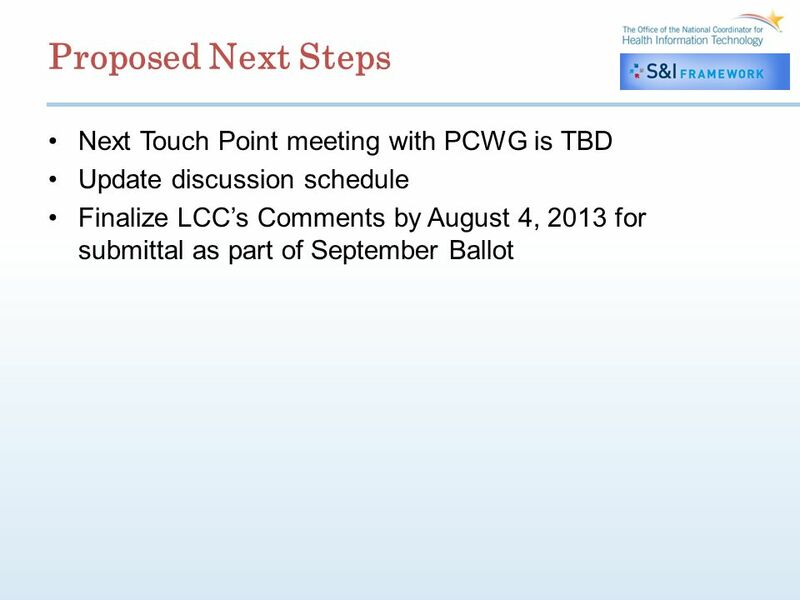 29 29 HL7 v3 SNOMED CT Definitions, contd… "Concern": The HL7 Patient Care Technical Committee is developing a formal model for condition tracking. 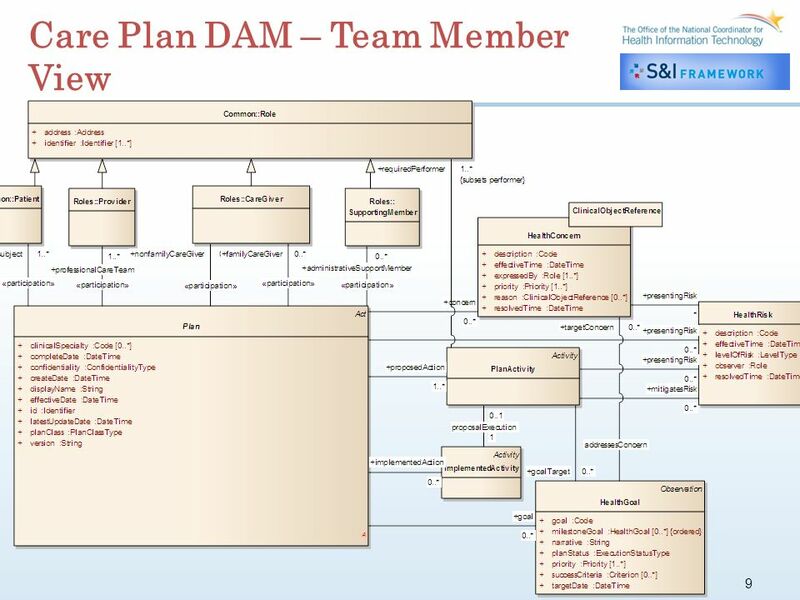 In that model, a problem (which may be an Observation, a Procedure, or some other type of Act) is wrapped in an Act with a new Act.classCode CONCERN. 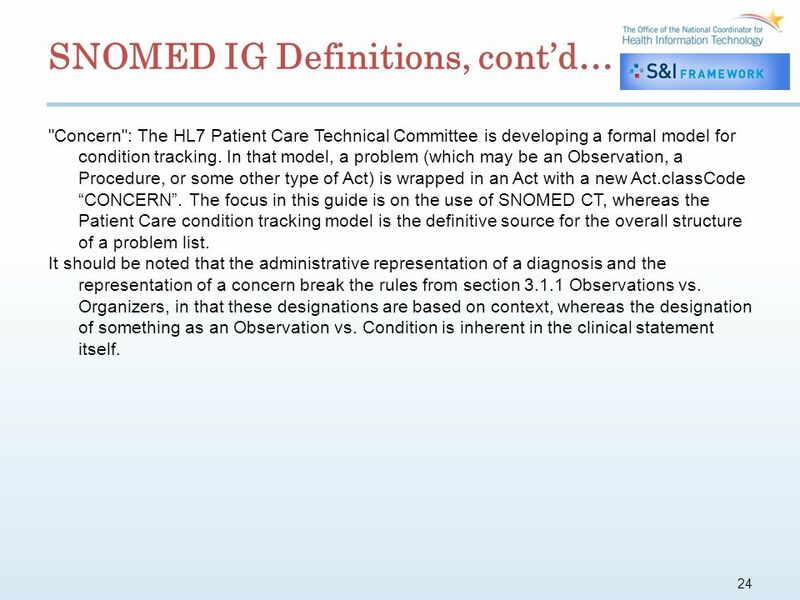 The focus in this guide is on the use of SNOMED CT, whereas the Patient Care condition tracking model is the definitive source for the overall structure of a problem list. It should be noted that the administrative representation of a diagnosis and the representation of a concern break the rules from section 3.1.1 Observations vs. Organizers, in that these designations are based on context, whereas the designation of something as an Observation vs. Condition is inherent in the clinical statement itself. 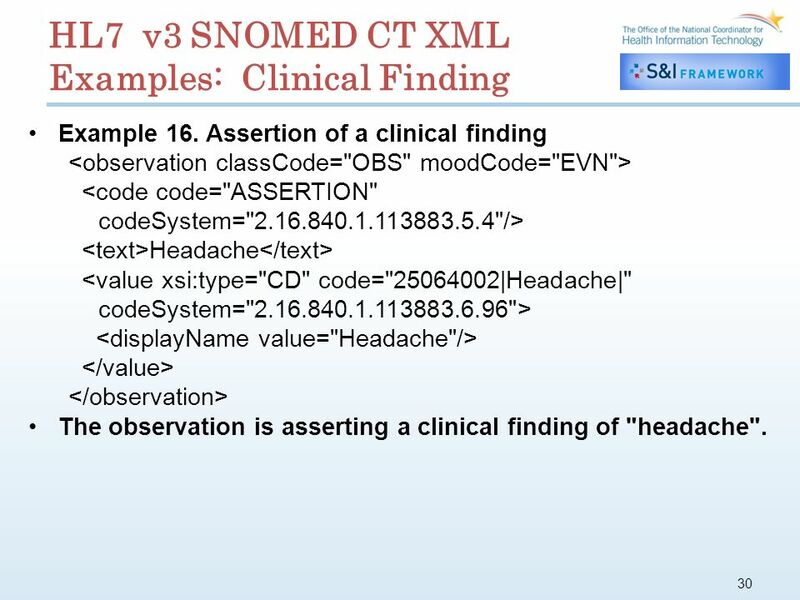 30 30 HL7 v3 SNOMED CT XML Examples: Clinical Finding Example 16. Assertion of a clinical finding Headache The observation is asserting a clinical finding of "headache". 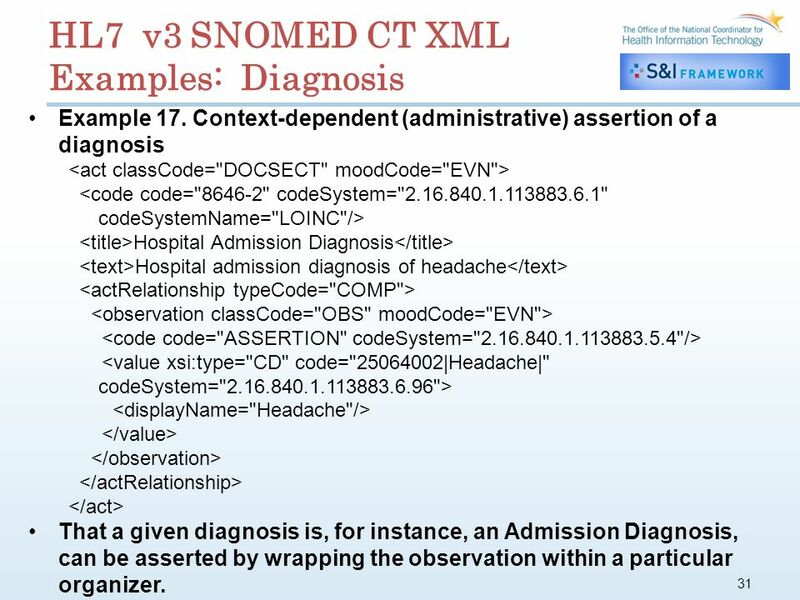 31 31 HL7 v3 SNOMED CT XML Examples: Diagnosis Example 17. Context-dependent (administrative) assertion of a diagnosis Hospital Admission Diagnosis Hospital admission diagnosis of headache That a given diagnosis is, for instance, an Admission Diagnosis, can be asserted by wrapping the observation within a particular organizer. 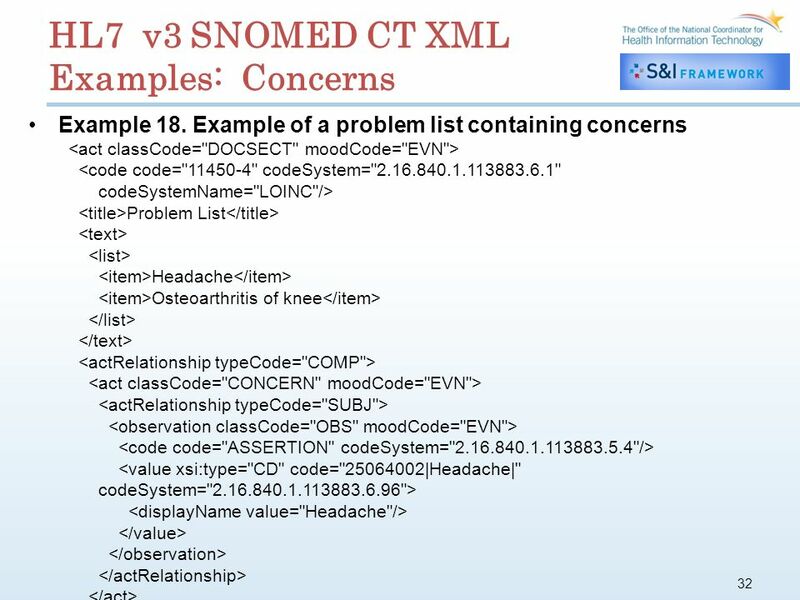 33 33 HL7 v3 SNOMED CT XML Examples: Concerns, contd…. 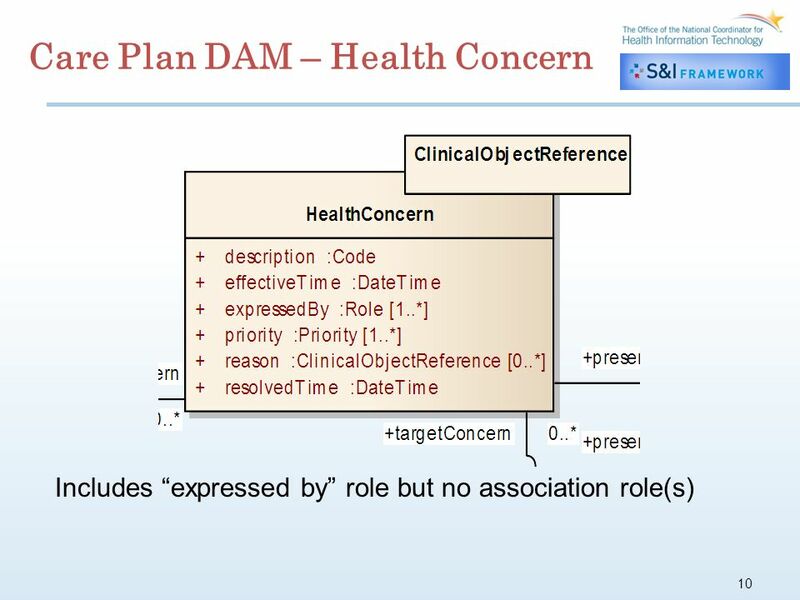 That a given clinical statement is a part of a condition tracking structure can be asserted by containing the clinical statement within the concern act, using the mechanism defined by the HL7 Patient Care Technical Committee, as shown here. 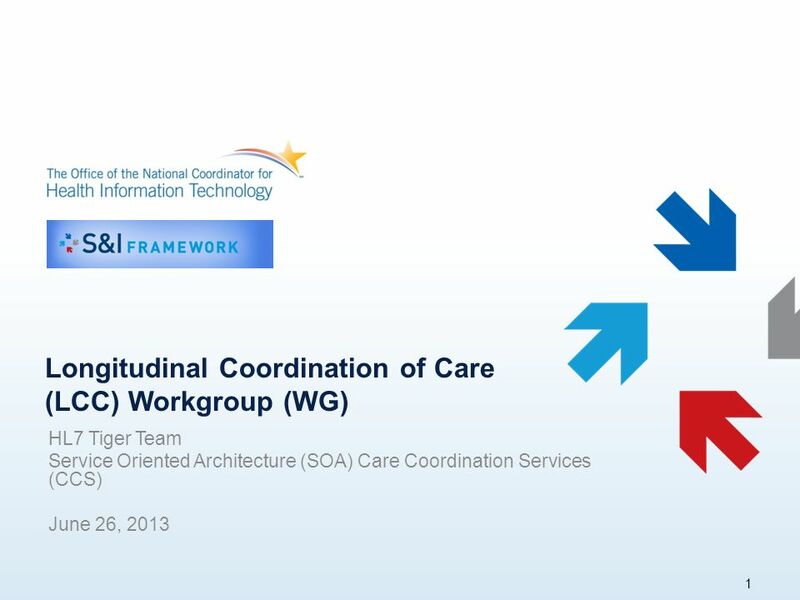 Download ppt "Longitudinal Coordination of Care (LCC) Workgroup (WG) HL7 Tiger Team Service Oriented Architecture (SOA) Care Coordination Services (CCS) June 26, 2013." 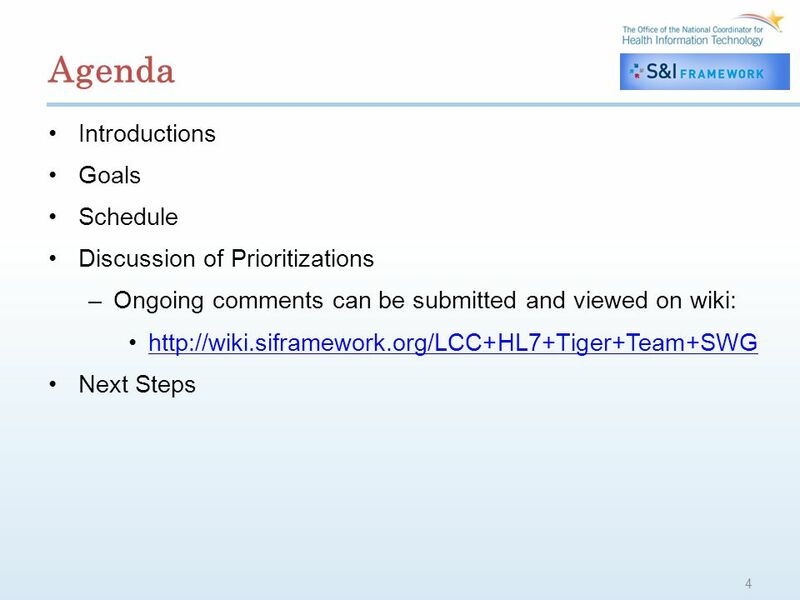 Longitudinal Coordination of Care (LCC) Workgroup (WG) HL7 Tiger Team Service Oriented Architecture (SOA) Care Coordination Services (CCS) June 19, 2013.